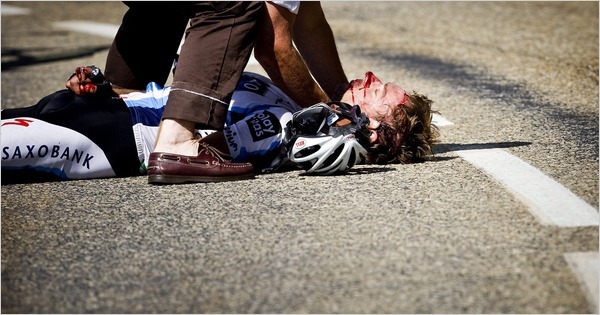 Last year during the Tour de France, Jens Voigt, one of the finest and most popular cyclists in the world crashed on a downhill descent and faceplanted on the asphalt going about 40 miles an hour. He shattered most of the bones in his face as well as split his jaw in two. He was unconscious for over four minutes. He is lucky to be alive. The clip of the crash follows this post. I’ve bit it a few times on my bike and watching Jen’s spill made me queasy. To get an idea of what crashing on a bike is like, push yourself out of a car going 40 miles an hour. It is that reality that keeps some bikers from every riding again. Jen returned two months after his devastating crash. The ability to bounce back as he did is testament to his mental fortitude, the healing of his psychological resistance and fear of getting back on the bike. We too must hone our mental resistance to the crashes in our life and get back on the bike. Getting back on the bike takes a stubborn resolve not to finish with a crash – to not go out as a quitter. Getting back on the bike takes mental discipline forged over years of adversity. That is after all the only way to gain wisdom. Getting back on the bike quite simply means getting back on the bike. Though you may hesitate, though you might be worse for the wear, getting back on means you will finish the race and finish it strong.